8 posts categorized "Performing Arts"
I was bored stupid in the last few days because of my bout of sickness. I still feel very weak today (jello arms and jello legs!) so snowboarding is out of the question. However, I figure bouncing about in front of a stage is probably easy enough so I decided to go to the Mobile concert at Nathan Phillips Square as planned. I'm so glad I went! The energy of the show was fantastic despite running into a few technique issues (broken string, liberal use of duct tape, out of tune guitars due to the cold...). Alas, if I had my voice, I would have screamed and cheered so loud. Check out some pictures and video that I took at the concert! I returned to Nathan Phillips Square tonight once again for another free concert, this time featuring Sloan. Perhaps it was the slightly warmer weather, perhaps it was Saturday night, or perhaps Sloan attracts more fans...whatever the reason, the crowd was much bigger tonight and I could easily tell that there were some diehard fans in the crowd. The muscial style of Sloan is quite different from The Philosopher Kings but one common trait that really stood out was the importance of having a charismatic frontman. I'm not talking about a pretty face, rather, someone whose stage presense is larger than life in a way that positiviely connects with the audience. Here is a brief video that I took during the concert, enjoy! If you're in Toronto during the next two weeks, I highly recommend you to check out our WinterCity Festival. I just came back from the opening festivities held at Nathan Phillips Square including a free concert by The Philosopher Kings, which played an awesome show btw. I'm not particularly familiar with their music but I went on the recommendation of a friend who recently went to their concert. Although my musical taste leans toward pop, I love the jazz influence of their music and this element made their sound so much more accessible to me. I'm also very impressed by the virtuosity of each members of the band, especially the little friendly duelling between the guitarist and bassist. Despite the cold and snow, the crowd really got into the music and I somehow managed to park myself at the second row in front of the stage! I love to attend outdoor concerts in general because of the energy of the shows and this time is no exception. 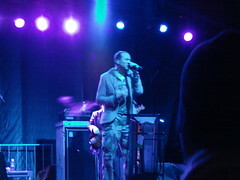 However, I must say that this is the first time that I watch a concert in the snow! The sparkling curtain of snowflakes in the colourful lights was an unexpected visual treat. There'll be a few more concerts coming up including Sloan, Mobile, and The New Pornographers. Hope to see you there! Another really neat attraction at the Nathan Phillips Square is the Paintings Below Zero gallery of artist Gordon Halloran (see some of my pictures here). 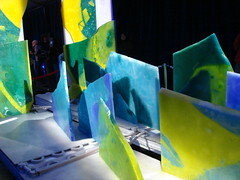 As the title suggested, this is an installation of paintings on ice. Don't come here expecting your usual ice sculpture...the contrasts between light/shadow and warm/cold colour were really what captivated me. If you take a closer look, you can also see the crytalization patterns on the ice and how the colour brought out this natural beauty so vibrantly. J and I went to a performance of Much Ado About Nothing at the annual CanStage Dream In High Park. It's only an abridged version of the play but I found it quite lighthearted and entertaining. I'm not a regular theatre-goer so it took me a little while before getting into the stories and getting used to the old English dialogues. But once I did, I really enjoyed the verbal sparring between Beatrice and Benedict. You know, there's something very romantic about theatre under the stars. If I wasn't feeling under the weather, I really wished the night would never end.